Heidelberg Castle- Touring the Romantic Ruins | Travel? Yes Please! Situated on the slopes of Königstuhl Hill, Heidelberg Castle stands majestically over the historic Old Town below. This sandstone palace, well revered throughout history for its beauty, now exists in partial disrepair. A collection of roughed-up buildings remain, each at one time an extraordinary example of Renaissance architecture. The palace’s romantic location on a forested hill, its fine architecture and tumultuous history, have helped make Heidelberg Castle a favourite among visitors to Germany. The first mention of Heidelberg Castle was recorded in 1225, well before it served as a royal residence. It wasn’t until Prince Elector Ruprecht III (1398 – 1410) that the castle was expanded and became home for most of the Prince Electors of the Holy Roman Empire. Throughout the 16th and 17th centuries, the Prince Electors continued to add palace buildings, creating a beautiful frame for the inner courtyard. 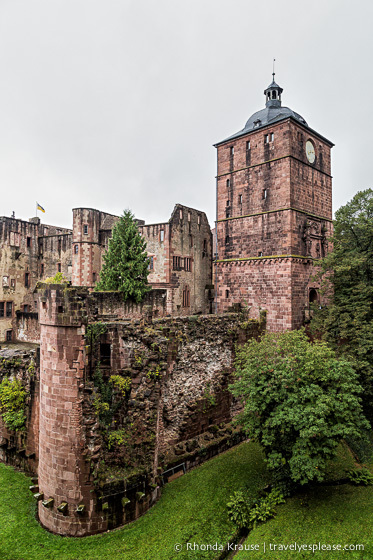 The Thirty Years War marked the beginning of turbulent times for Heidelberg Castle. The palace was repeatedly attacked during this conflict but managed to survive until the War of the Grand Alliance (1689–97), when the castle was destroyed by the French. After the wars, repair of the castle began but tragedy soon struck again. In 1764, lighting struck the palace, not once, but twice. The buildings caught fire and ended up in ruins. After the devastating fire, the citizens of Heidelberg began raiding the rubble, taking the castle stones to build new houses. This practice was put to an end by Count Charles de Graimberg in 1800, when he took interest in conserving the castle ruins. There was much debate about whether or not the castle should be completely rebuilt. A commission of specialists ultimately decided that a complete, even partial rebuilding, of the castle was not possible. Instead, they decided to preserve the castle in its current state. The only building that was restored was the Friedrich Building, since only the interior was fire damaged. Heidelberg was the last stop on our five week honeymoon in Europe. We made a bit of a detour on our way to Frankfurt, specifically so we could visit this famous castle. It was well worth the trip! We very much enjoyed our tour of Heidelberg Castle and thought it was unique compared to other castles we visited because it was part palace, part ruins. Even though a large portion of it is destroyed, you can still tell how grand it used to be. A model of what the castle used to look like. As impressive as Heidelberg Castle was, what made our visit so memorable was our guide. You could tell he loved his job immensely. He was so passionate about the castle and the royals that once lived there. He talked about them like they were close personal friends! The highlight of our tour of Heidelberg Castle was visiting the royal wine cellar, home to the world’s largest wine barrel (the Great Tun). It is incredibly big- seven metres wide and over eight metres long! It was made from 130 oak trees and can hold precisely 221,726 litres of wine. Sounds like those royals sure liked to drink! Another part of the castle we loved was the Great Terrace. From here you can overlook the rooftops of the Old Town for a fine view of the Neckar River and Valley. After visiting Heidelberg Castle, we walked down to the Old Town, where we enjoyed a nice meal. We kept saying it was a shame we had to get to Frankfurt that night because we would have liked to explore Heidelberg a little more. The castle is open from 8:00 am to 6:00 pm (last admission at 5:30 pm). The interior of the palace may only be viewed as part of a guided tour. While it’s nice to look around the outside, you don’t get to hear all the interesting stories about the castle and the people that lived there. Tours of Heidelberg Castle are available in German and English and run hourly. English tours begin at 11:15 am on weekdays and 10:15 am on weekends. Admission is €8.00 for adults. This includes use of the funicular railway to reach the castle, viewing of the Great Tun wine barrel and entrance to the German Apothecary Museum on-site. For a guided tour, there is an additional fee of €5.00 for adults. There is a parkade very close to the funicular, but it does fill up. We had to wait in line for a while to get in. *Information was correct as of February 2019, but can change without notice. Please confirm costs and times directly with service providers. For your convenience, here is a list of hotels in Heidelberg. Please consider booking your Heidelberg accommodations through the included link. It costs nothing extra and helps support this website. Thank you!